Dr. Giri received his NDEB (National Dental Examining Board of Canada Certificate ) in January 1995, after having earned a dental degree from the University Of Havana, Cuba, College of Dentistry in 1988. He owned a busy dental practice located at 3480 Lawrence Avenue East Scarborough for over a decade, currently, he has opened a home based practice in Richmond Hill, Ontario. Dr. Giri is a multilingual dentist who is fluent in English, Spanish, Tamil and Sinhalese. Dr. Giri was appointed to the Scarborough General Hospital Medical Staff in 1996. Since then he is affiliated with Scarborough General Hospital. Dr. Giri is a Fellow of the Academy of Dentistry International FADI , FICD, and FPFA. He was the past President of Toronto East Dental Society, a component society of the Ontario Dental Association currently he belongs to York Region Dental Society, and now serves as a Alternate Councilor. He is a member of the Canadian Dental Association, Academy of General Dentistry, Toronto Academy of Dentistry (member of the Golf Committee). He serves in advisory capacity for Providence Community Partners in the Healthcare Foundation. 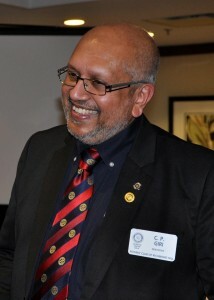 Past President of Richmond Hill Rotary Club Member of Richmond Hill Board of Trade. Dr. Giri is a visiting lecturer and external examiner at the University of Guyana School Of Dentistry. Through his continued devotion to serving the community in a number of ways, he was involved in providing humanitarian aid including delivery of medical / dental services in Cuba, Guyana and in Sri Lanka. Dr. Giri was a past student of Hindu College Colombo, Sri Lanka.